…it doesn’t come naturally to most people/organisers… but it’s precisely that change of focus in action and planning habits that seems to be baulked at the most. A lot of the time, it’s not impossible to do or to organise…(it) is totally doable, but hey, maybe it’s not something you’re going to remember easily when it’s not a constant factor in your own life/work! Once you re-train yourself/habits, it seems weird not to have done it that way in the first place… accessibility isn’t actually that difficult once you’ve made that initial effort. The 6-9pm time slot we decided on was never going to be parent friendly and there was little we could do about that. But it was the hardest of the criteria to meet in that meeting it radically reshaped our vision – weekends are unattractive for a regular meet, work hours are too, and in reality, no time is good for all parents, depending on number and age of children. Further, children friendly venues – potentially alcohol free, healthy food, safe play space – are hard to find, expensive to book, or too busy for a semi formal gathering, for exactly those criteria we were after. 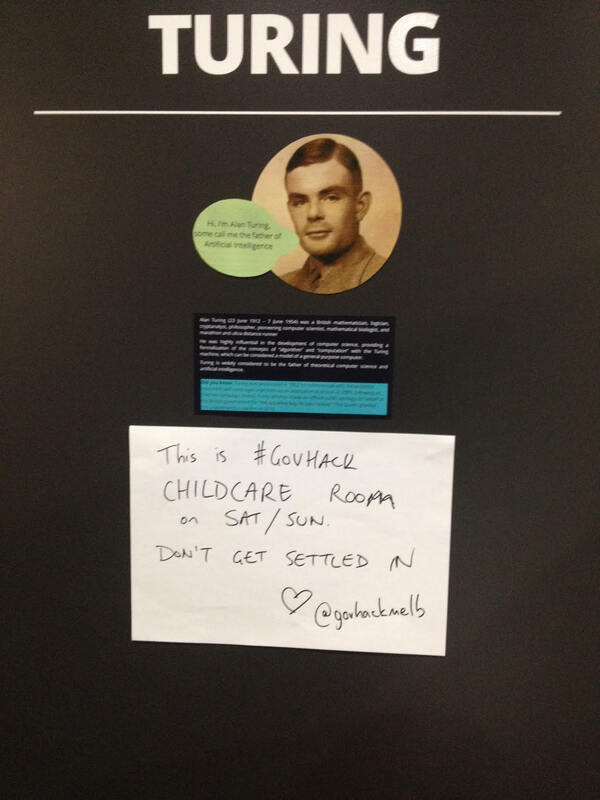 So we made a commitment to make GovHack as accessible as possible for parents. If we can’t make our weekly event family friendly, our annual flagship event absolutely would be, whatever the cost. I have connections to a child care centre, so I went to them and asked what they thought, what I would need, how many carers per child per age group, etc. We all know that getting expert advise is usually the best option, and for something that’s otherwise outside of our skill set, it’s essential. On their advice, I then rang the relevant Government department to see what the law was with regard to certification. A call to the City of Melbourne, in which I was bumped to three different departments and spoke with 4 different people, discovered that there were no municipal requirements. They eventually advised I speak to the Department of Human Services. After speaking to only two people at the DHS, the friendly Colin advised me that according to the Children’s Services Act 1996 (pdf), Part 1, section 5(1B)(g) “Non-application of this Act”, we were exempt from any particular regulation with regard to what we were required to provide by law. Because GovHack is an “ad hoc seminar”, it does not fall under the act. For clarity I asked some hypothetical questions and he consistently answered “you don’t fall under the act”. I asked if a dog could be used to mind the children and his response was “you don’t fall under the act”. As soon as we knew this, we contacted our venue hosts, the very generous ThoughtWorks, and let them know that childcare was go. We had warned them previously that this was something we were committed to and would be chasing – they were absolutely accommodating. I have no idea if they needed to make any arrangements with their building insurance, but they didn’t blink. Having a good relationship with your venue host is a boon. We made a commitment to paying our childcare staff the award wage – we wanted professional child care workers with accreditation and working with children checks, and we value workers as much as parents. But we also didn’t charge a fee. This was important to me – accessibility is as much about cost of a service as it is providing the service. I made a personal commitment to fund the childcare regardless of the uptake or sponsorship, to which the rest of organising group immediately agreed to kick into. Thinking it would cost about $1500 in wages, we asked for more to pay for extras like games, toys, and craft stuff. It ended up costing around $2000 in wages for four staff. We advertised that we were planning on providing this service early, and to the people we knew would help us spread the word to the target audience – Twitter, the Women in Science network, etc. It’s a pretty easy sell to get people interested, to be honest. The IT sector has taken a well deserved beating over the last four or five years about its prejudices, privileges and inaccessibility. All of which are embarrassing and solvable problems – but only if you try to solve them. I think that it’s important to show that you are serious for people to believe you, which was why we were committed to providing childcare regardless of interest expressed by the community. I think that next year the uptake on childcare will be even bigger – because people will have seen that we deliver, and the news will have got out further again. And in fact, not only have we fielded questions from other community IT groups (bravo Ruby Conf Au), but the state government informally expressed that anything to get more people involved in the local technology scene was something they could get behind. We were lucky – the State Government was one of our sponsors, and they fully funded the service (thank you very much DataVic!). It took some wrangling – they didn’t jump on board straight away, but we wouldn’t let them cut it from the budget/sponsorship package. In fact, it took up a large chunk of our budget – around a third. But we had also approached Microsoft to fund it, and would have kept chasing other potential sponsors had the Vic Government not come through – for the cost, it’s cheap advertising for any brand, and ostensibly good brand management given the issues the industry has faced noted above. Before the event we had seven expressions of interest (we got more retweets than that!) via the survey, and three definite, maybe four via the ticketing question within Eventbrite – but that could have been the same group. I can count at least five occasions where one of the organising collective was in a discussion with potential attendees, data owners, sponsors, mentors, volunteers and other collaborators in which someone has said “but I’ve got kids, so that weekend…” and we have told them that we would have paid, professional childcare. People would always be surprised, shocked even. They look at you funny and say “Really?” and then you can see their mental cogs turning. All have been impressed. So that’s how you provide childcare. Finding the money is the hardest challenge, but since we were willing to pay that out of our own pockets, we just went ahead and organised it – build it and they will come. By the time the funders came on board we were already selling it to our community. Start the conversation early, start the process early, find some money. The community will back you up, have no fear. Service available from 9am-4pm on Saturday and 9am-3pm on Sunday – ie not the full days. But we also have venue curfews so that people get out of the building and we don’t need to find a volunteer for the 3am Sunday morning shift. No care for children 0-2 years old. We will be providing suitable entertainment as recommended by our childcare providers. We would also ask for your understanding that when all places are taken, we will not ask our childcare workers to stretch themselves. Depending on levels of demand, first in best dressed is probably how we will run it. Parents are expected to stay on site while their child is in childcare – this is not a drop zone for your shopping expedition. In the end there was one child in care all weekend, and three other parents took advantage of the service for shorter periods over the weekend. A success. This was Zaya, the biggest and happiest user of the service. If you think making your event accessible takes too much hard work, you should try parenting some time, or read up on Spoon Theory. This was a relative walk in the park. Big thanks to the whole Melbourne Open Knowledge team for all their support making the Melbourne GovHack awesome, Thoughtworks for being very cool, and Jordan for always saying yes when I said “what if we did this?”. A large part of this text was written before GovHack in response to a question from Pat Allen – thanks for asking, I would never have written it down to remember if you hadn’t. This also accounts for potential problems with tense in some parts of the text. 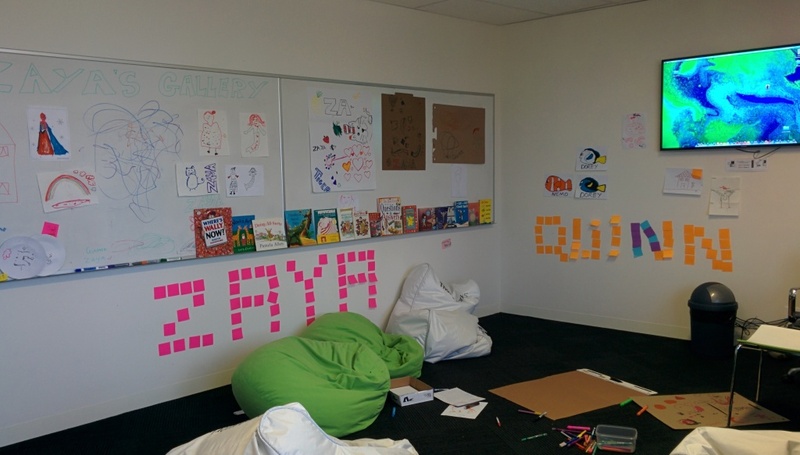 I think the original idea of offering childcare at Govhack came from Elena Yankova – an enthusiastic Brisbane Govhack 2014 volunteer. It would be nice to acknowledge her. 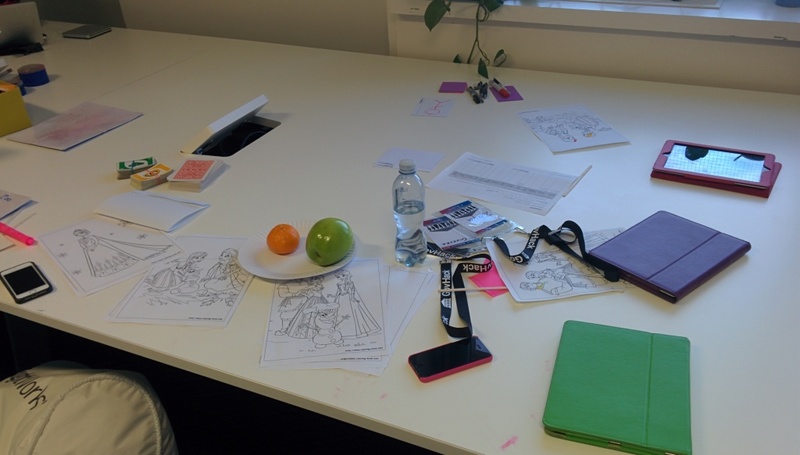 For what it’s worth, the Melbourne Open Knowledge team had no idea that Elena had bought it up – we had thought of it independently. I think we are finding that as hackathons and conferences are increasingly trying to be more inclusive, that many will come to the same processes and conclusions independently. Hi Anna, I’m sure the conversation about childcare at GovHack was happening at multiple sites. Seeing a few parents with prams come by as observers last year showed me there was a need, which was re-emphasised to me when I attended SkudCamp (geek feminist meetup) late last year. 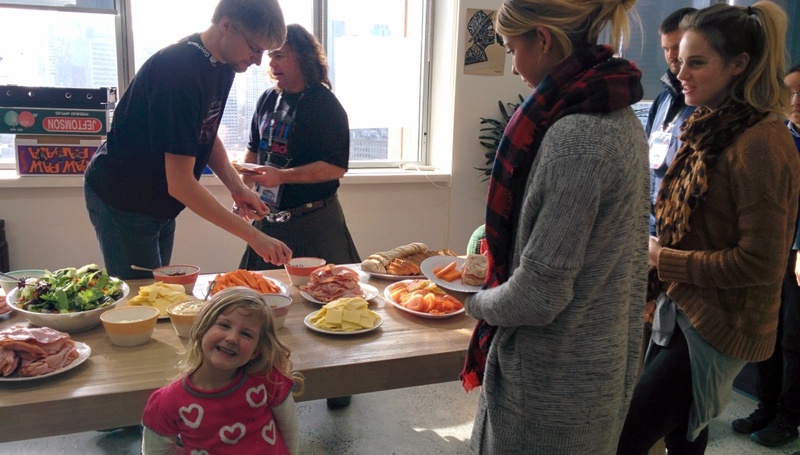 Childcare at GovHack Melbourne this year was the result of Lachlan’s hard work. No disrespect to Elena but we didn’t know it was being discussed in Brisbane too!